These chips are perfect along side homemade salsa, guacamole or our Paleo Ceviche! 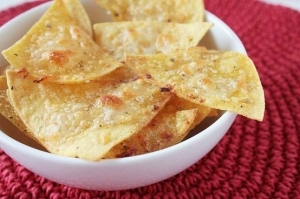 20 Responses to "Paleo Tortilla Chips"
Awesome recipe! Just made myself a batch of Paleo chips and they came out perfect! Finally! An easy way to make tortilla soup paleo friendly. Ya! That would actually be a great use. Tried these, and I think I rolled them too thick…need to go a bit thinner. Next time I'm going to separate the dough into 2 balls before rolling it out so it doesn't get quite so thick. Also, for me 10 min was way too long at the thicker size, so I'll be cutting it down to 5 min at a thinner roll out. Here's to experimenting 🙂 Thanks for a great recipe to get me started! Tortilla chips are one of my weaknesses…with guacamole or salsa…yum! I'm wondering if the picture is one you actually took of these chips. Mine do not look like your picture. But tasty and satisfying! Oh, and I prefer mine fried in coconut oil. Not sure if frying is okay on a strict paleo diet but I guess we all need to 'diverge' once in a while and if it's coconut oil that makes me feel like I'm diverging – well, that isn't so bad. I'm only able to find Almond Flour/meal. Is it the same thing? I live in a very small city so it's hard to find lots of the things I see for these recipes. yes, its exactly what it is. in fact calling it almond flour is simply incorrect, you cannot get a flour from a nut, flour comes from wheat products, what they really mean is the almond meal. if you find that hard to get or expensive just buy your own almonds and put them in your food processor with the cutting "S" shaped blade. for a more earthy meal leave the skins on the nuts, for a more white "flour like" blend buy blanched almonds. simply 🙂 hope i have helped. Karen Ethier Maybe instead of frying in coconut oil, after baking for about 5-7 minutes, turn off the oven and turn the broiler on high? Only thing I can think of. I'm gonna try these tomorrow and see how they go.